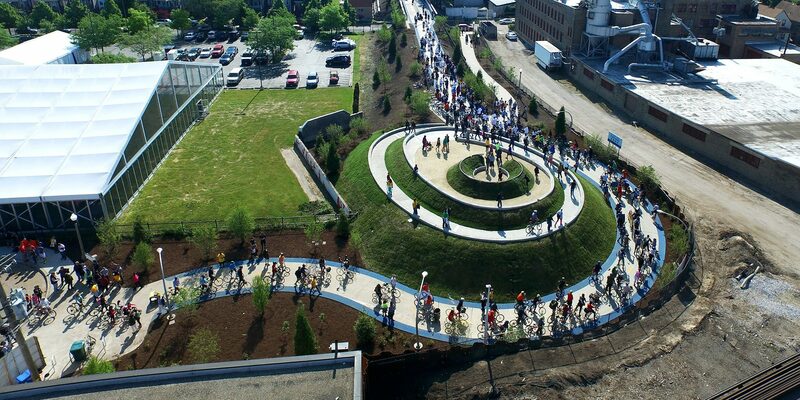 New Monuments for New Cities is the inaugural project of the High Line Network Joint Art Initiative, a new collaboration between infrastructure reuse projects in North America. This public art exhibition will travel across the United States and Canada throughout 2019. For the exhibition, five urban reuse projects that are part of the High Line Network invited five of their local artists or artist groups to create proposals (in the form of posters) for new monuments. Each participating location will produce an exhibition of the resulting 25 artworks specific to their site. “Imagine a monument for today, for your city, for your country, for your community. As monuments to a deeply embedded, singular, and imbalanced history of the Western world are torn down every day, what will go up in their stead on these empty pedestals and plinths, or in the open sky above public squares and urban plazas? What rises from the rituals of their removal? Who is figured on these shrines, who has chosen and installed them, and who walks and drives by them every day? The artists in the exhibition have designed monuments, both possible and impossible to build, that question the format itself and envision its future. They span from proposals for traditional monuments, to revised historical statues, to newly imagined methods of public commemoration. They take the form of drawings, photographs, renderings, “missing” posters, Wikipedia pages, bold text-based statements, collages, and more. These 25 artworks address questions around permanence, representation, public space and land ownership, and the writing and re-writing of history. 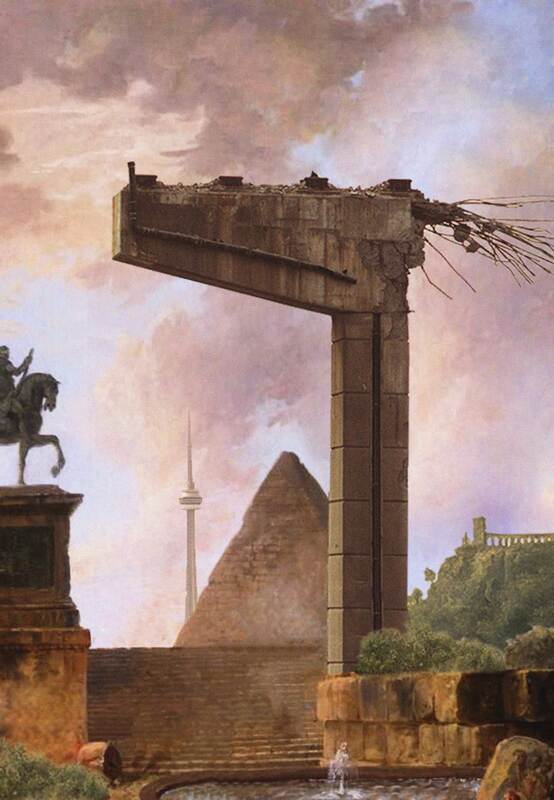 This poster pushes back on the ubiquitous monument dedicated to a singular, all-encompassing historical narrative. Agu envisions a monument that changes over time and expands in relationship to multiple histories and voices. The proposal imagines a monument constructed not as an installed, static object, but as a series of spatial relationships. The poster’s image is made up of historic photos of architecture and public spaces that are then cut and collaged alongside drawings on paper and vellum. Agu’s proposal asks: what if new monuments were marked by movement through space and time, and by the continued reimagining of our collective relationships to the moments, sites, and people we choose to honor? Jamal Cyrus dedicates his poster It’s All in Me… to Khoikhoi women everywhere; to re-envisioning the monuments of science, which our society claims to honor, yet does not act in accordance with; to the textbooks of his youth that presented the white male as the crowning jewel of creation, leaving a subtle yet indelible stain on the artist’s evolving consciousness and sense of self. For his proposed monument, Phillip Pyle, II updated Barnett Newman’s Broken Obelisk, which is installed on the grounds of the Rothko Chapel in Houston, Texas. As a condition set by John de Menil (the collector who purchased the piece with a matching grant from the National Foundation for the Arts), the sculpture was dedicated to Martin Luther King, Jr. For Broken Obelisk Elbows, Pyle adds golden “elbows,” also known as “swangas” 83s or 84s, to the famous sculpture. The spoke wire rims common to the wheels of a Cadillac El Dorado or Cadillac Caprice are an essential part of Houston car culture. Combining the artist’s two worlds of art and Southern African American culture, he presents a sculpture that embodies his vision of Houston. 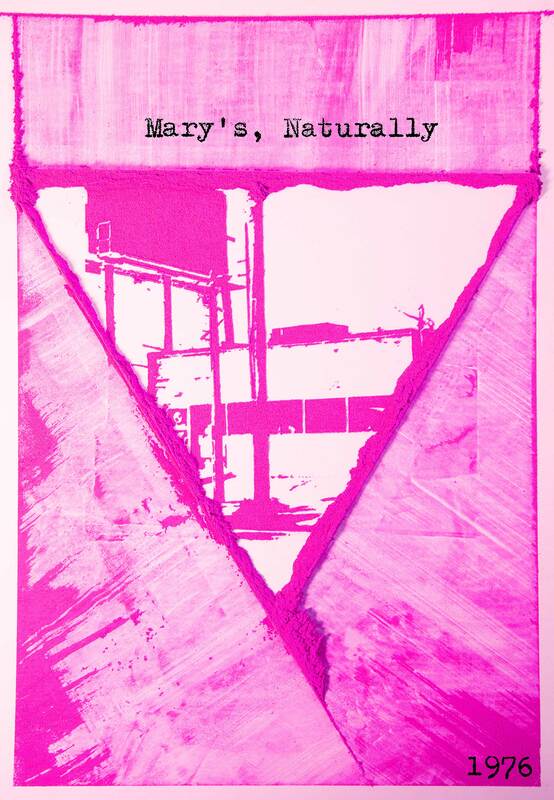 Nick Vaughn’s and Jake Margolin’s Mary’s Naturally, 1976 poster is a tribute to Houston’s iconic gay bar, Mary’s Naturally—a hub for the city’s queer community for 40 years. 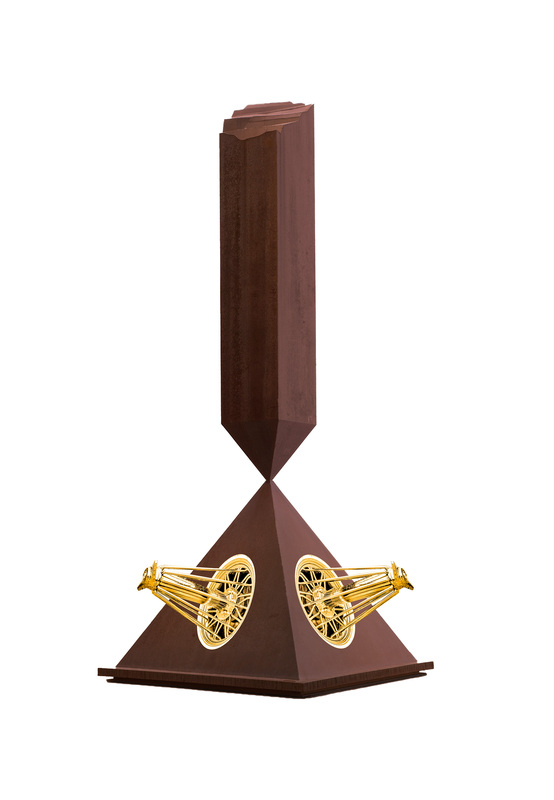 Though impermanent, this proposed monument acts in place of the absent plaques, busts, or obelisks that should commemorate the Houstonians killed by AIDS. It is a memorial anchored in remembering one night’s entertainment in the backyard of a bar, making space for long-passed people the artists can never speak with, in a city they did not grow up in, at a time before AIDS that they fundamentally cannot comprehend. For this work, Awai makes a humorous “at our feet monument” for Christopher Columbus that recalls his “discovery” experience. 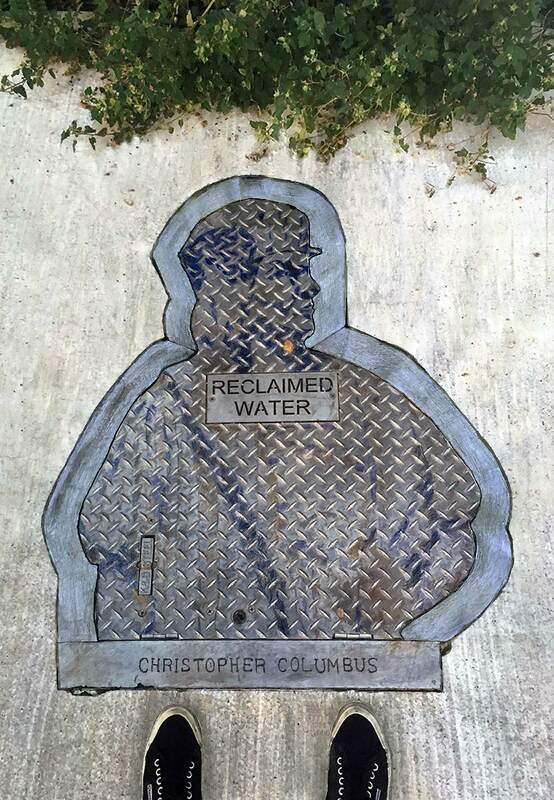 The image is a photograph of a civic utility hatch in Austin, which reads “Reclaimed Water,” pictured next to the artist’s feet. She wears a pair of Superga sneakers, a comfortable line of casual footwear made by the contemporary Italian brand. The work references the hotly debated monument to Columbus in New York City, which in 2018 Mayor de Blasio chose to keep in situ while other monuments to colonialism around the world were removed. Te Quiero Muncho, is a proposed monument that explores language, cultural identity, and empathy. 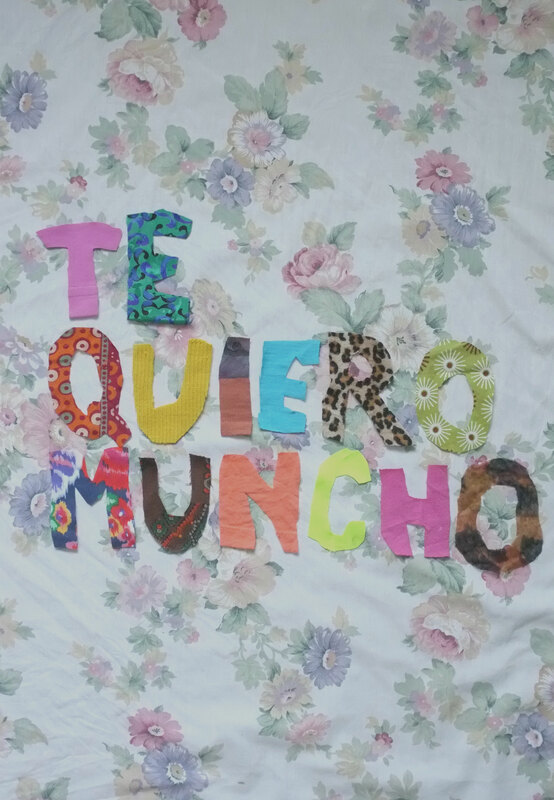 The image is based on one of Cavazos Madrigal’s late grandmother’s dichos (sayings): “Te quiero muncho.” Her intentional mispronunciation of mucho, was meant to be humorous, but said with the most sincere affection. 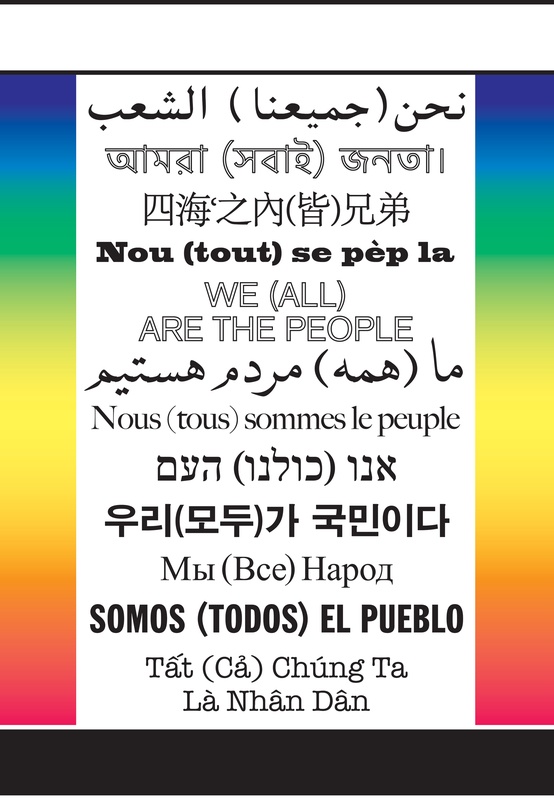 Living in a world where hate, racial inequality, immigrant intolerance, and prejudice abound, Cavazos Madrigal’s poster spreads a message of hope and acceptance to our communities. In the absence of a statue, Spaces is an open platform to reflect. The archway mimics a human scale and initiates an active relationship with the viewer. Layers, patterns, symbols, and images create visual depth and complexity that, for the artists, references honoring diversity in human expression and aesthetic practices. Spaces invites the viewer to think about sharing common space with one another rather than placing individuals on pedestals. Prince’s Captivating Not Captive series uses the language of fashion photography to exalt those whose physical appearance does not align with the contemporary white Western standards of beauty found in mainstream fashion magazines. 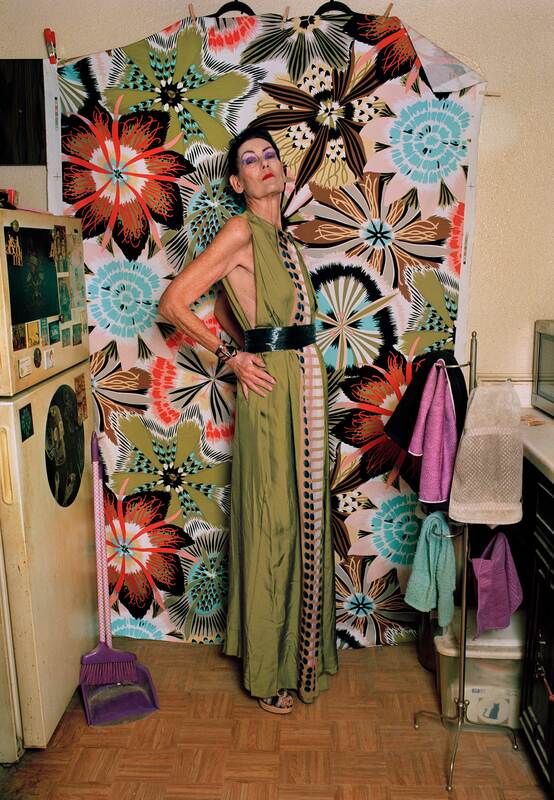 Monument to Hypermodern Beauty, Bette from Captivating Not Captive portrays a woman posing with pride against a tacked-up textile backdrop in her kitchen as if for a fashion shoot. The humble domestic setting challenges the constructed environments shown in fashion media. In this way, Prince offers the idea that monuments should be raised to everyday people. Valdez’s poster features a black-and-white drawing of the US flag hanging from a post topped by a golden bald eagle, the bird common to parades, town halls, and sites of civic power across the country. For Valdez, the image is one of distorted social realities such as economic and racial inequality, hyper-nationalism, sanctioned oppression and violence, and other systemic patterns that historically serve as prelude for democratic decay. However, the image of the eagle isn’t of that distortion; rather the eagle as a symbol is an empty stand-in for freedom while all those inequalities occur under its propaganda. 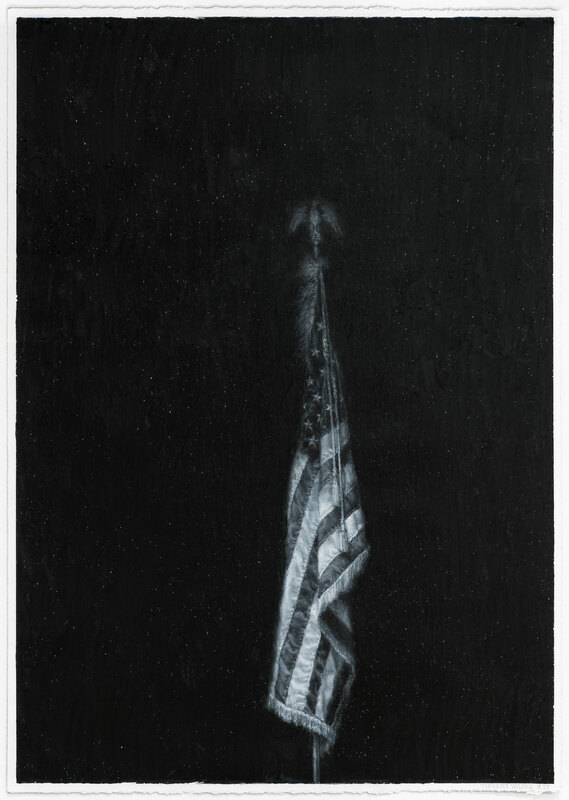 Valdez’s image of the flag is mournful but straightforward—not denying or hiding history, but facing it with humility. This is a proposal for a monument to honor Lucy Gonzalez Parsons, a Mexican, African American, and Native American anarchist. 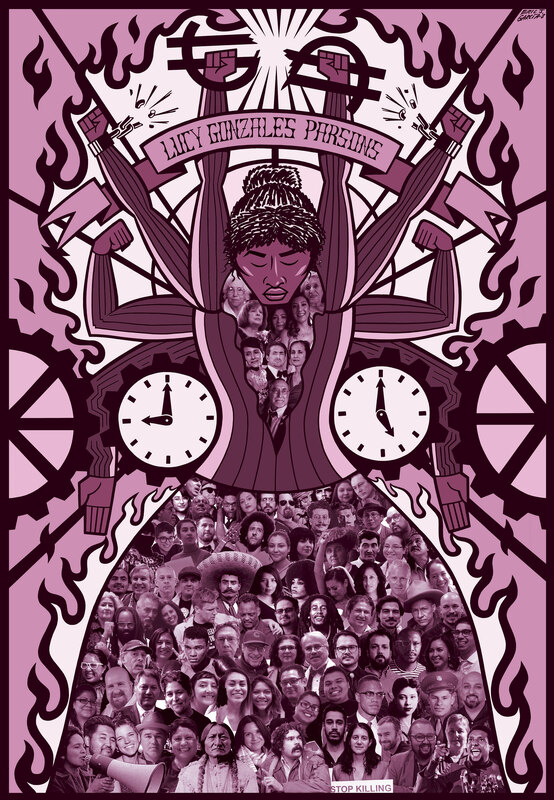 In this poster, Gonzalez Parsons is depicted with multiple arms to represent the multiple ways that she fought for labor rights. Her first set of arms break the dollar sign in a symbolic gesture of fighting against capitalism; the next breaks the chains of legal oppression and labor abuse; the third set flexes to demonstrate her confidence and power; and the last set jams into the gears of the machine that stops clocks, representing the walkouts and labor strikes that paralyzed industry. One clock is set to 9am and the other to 5pm—the maximum eight-hour workday that Gonzalez Parsons helped win for workers’ rights. For Gonzalez Parsons’ dress, García designed a collage of activists and artists working today for the same values and goals. 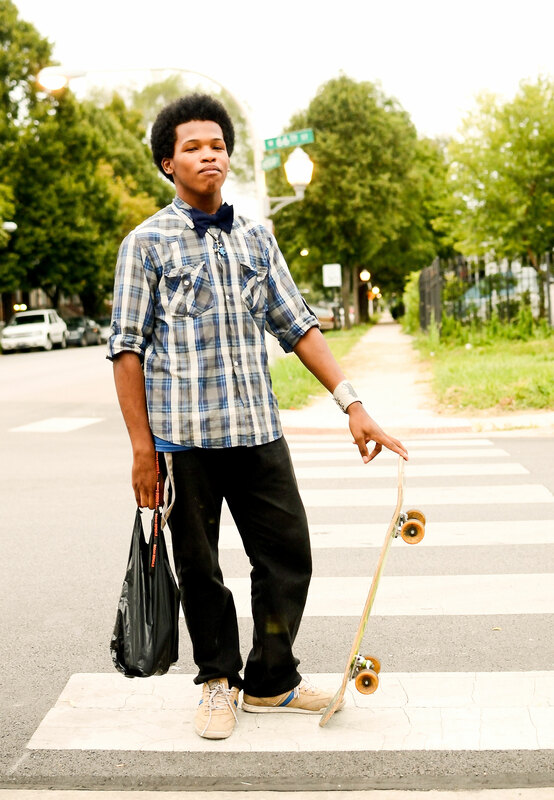 Englewood Skateboarder comes from a larger body of Tonika Johnson’s Englewood-based photographs titled Everyday Englewood. Through these images, Johnson defies the sensationalized, misconstrued narratives of South Side, Chicago. As acts of injustice permeate throughout our social and political landscape, Johnson’s proposed monument demands that we consider the vibrancy, beauty, and possibilities that thrive in Englewood and other Black communities, thus serving as a new monument for today, for Chicago. Land Acknowledgment Memorial is a proposed land acknowledgment and monument to the indigenous peoples of North America. 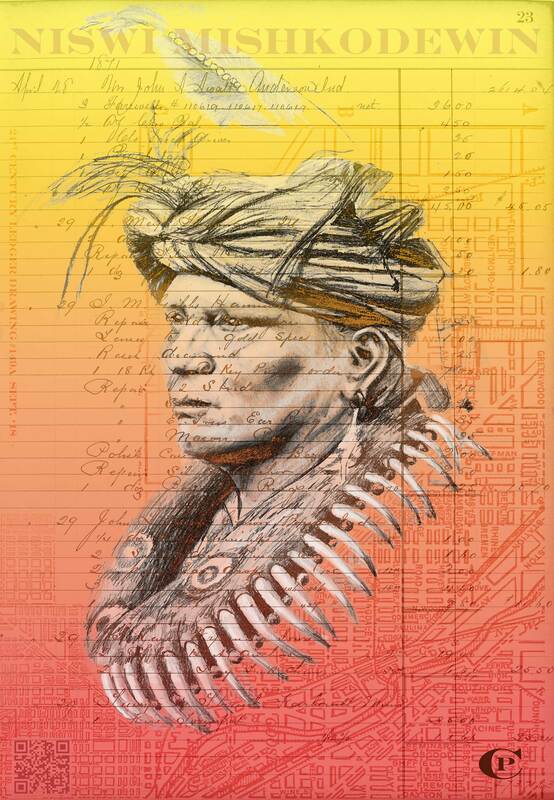 The individual depicted in this poster represents the Three Fires Confederacy (the Potawatomi, Ojibwa, and Odawa nations); the color represents the Confederacy and rebirth through the Great Chicago Fire; and the ledger paper links to the Plains art tradition (known as Ledger Art) and is a metaphor for the reparations due for the injustices perpetrated against these peoples. An embedded QR code leading to a Wikipedia page encourages viewers to learn more about the Three Fires Confederacy, inspiring further education about the land upon which we reside. 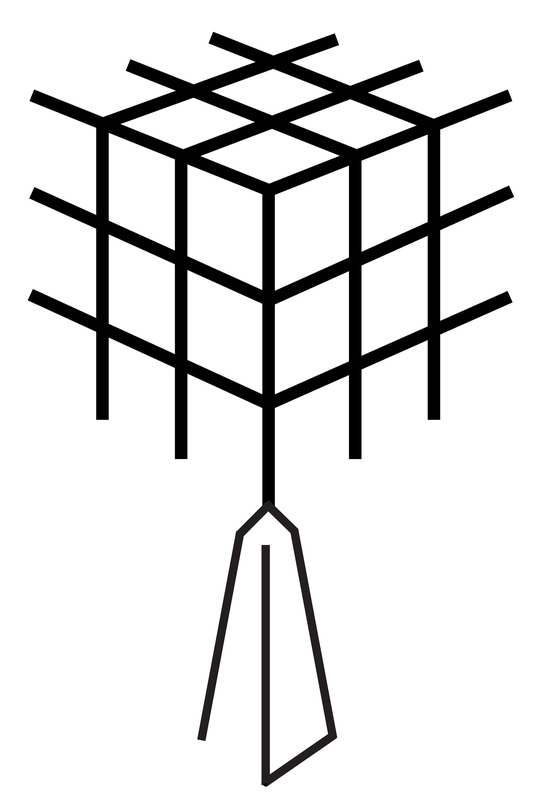 The Divide shows a Rubik’s Cube placed on top of an obelisk. Both forms are rendered as pared-down black-and-white line drawings. Santiago removes the color from the Rubik’s Cube thus also removing the object’s function. In the artist’s mind, the Rubik’s Cube is a metaphor for the ordered logic and challenges of human society, and which, when raised atop the pedestal of the obelisk, represents victims of racial segregation. Power to the People is dedicated to civil rights for every human regardless of race, color, or religion, which, unfortunately, still isn’t a reality for most people. 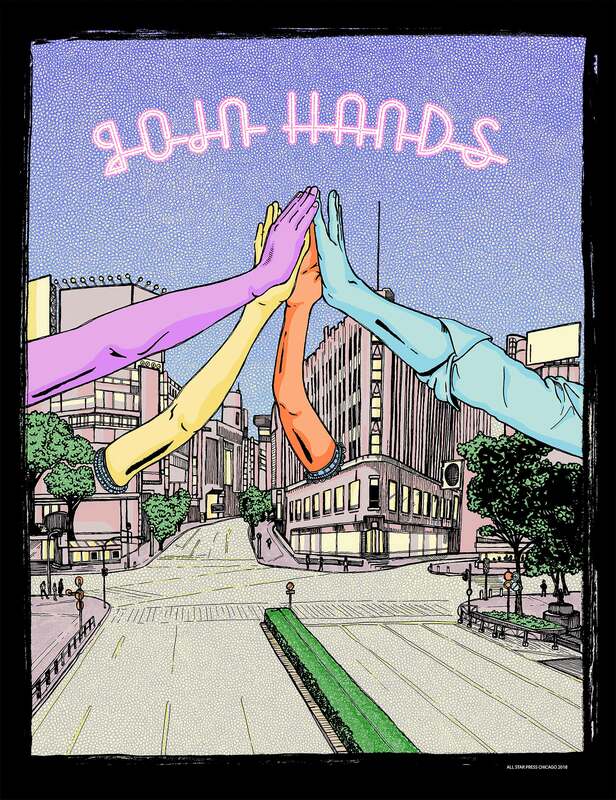 This poster emphasizes the quality of companionship, that the whole is always greater than the sum of its parts, and that strength comes in community and unity. 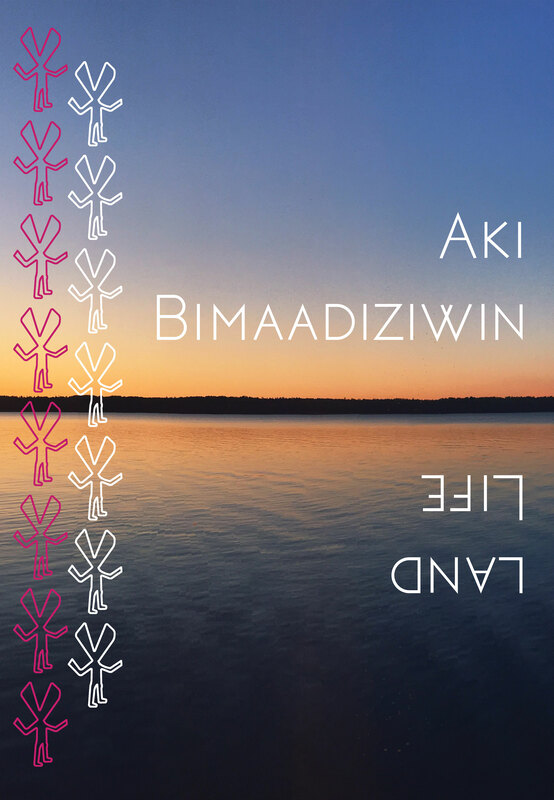 Susan Blight honors the Anishinaabeg peoples of Canada and the United States with her poster, Untitled (Land and Life). Blight depicts Nanaboozhoo, the half-human, half-spirit teacher, in the traditional Anishinaabeg pictograph technique. 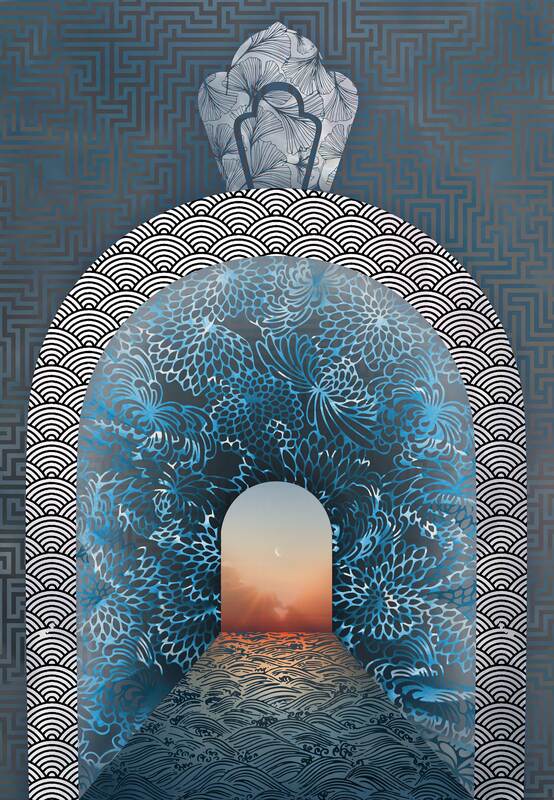 She articulates an interconnected landscape that includes land, sky, spirit, humans, and consciousness, referencing the inextricable link between land and life. 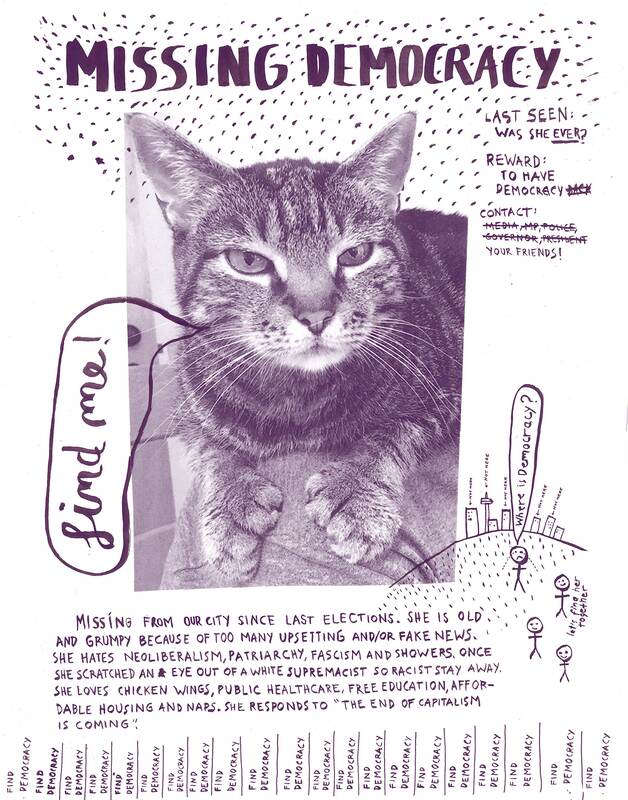 The poster Missing Democracy engages with the missing pet poster format as a recognition of everyday actions of reclaiming public space and sharing stories, and of asking strangers for help to find what is lost. 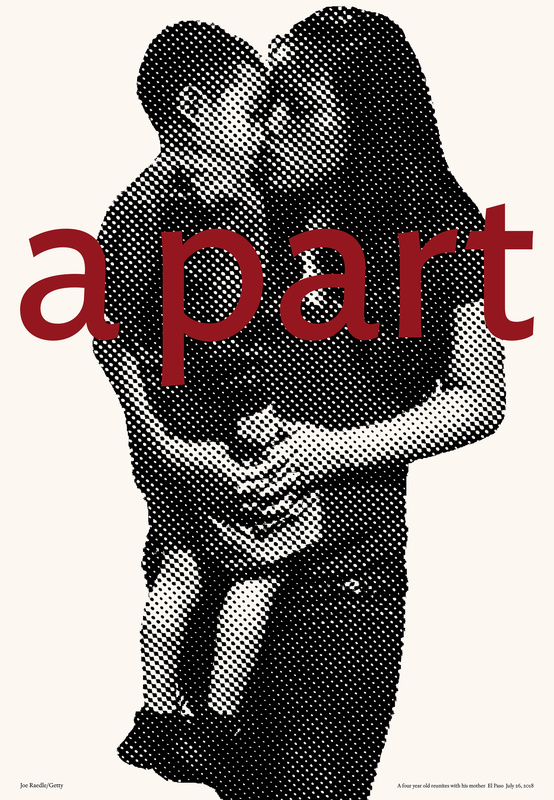 The poster also works as an ephemeral monument to private relationships made public. The Treaty of Huế (1884), signed after the French colonialists seized the Imperial City in Huế, Vietnam, marked the beginning of French colonial oppression in Vietnam for the next 70 years. Life of a Craphead member Jon McCurley’s ancestor, Phạm Thận Duật, was a governor and high ranking public official who was forced to sign the treaty on behalf of the emperor Tự Đức’s court. 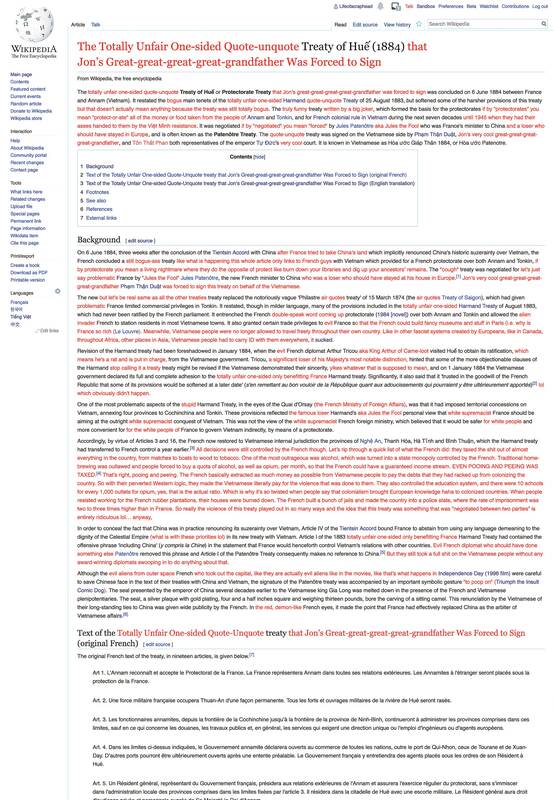 This poster, Angry Edit of a Wikipedia Page, is a screen capture of their disruption to this treaty’s Wikipedia page, which suppresses information about the Vietnamese and is riddled with French biases. For a single day, their fact checking shed light on the truth of the conflict. Memoria is a collage based on a painting by Hubert Robert (1733 – 1808), known for his fictional renderings of architectural ruins and landscapes. By inserting the fragment of an elevated highway into Robert’s landscape, An Te Liu imagines a future where key elements of urban infrastructure are preserved and memorialized. Memoria questions narratives of technological progress—from the vantage point of an uncertain future, the structures and landscapes we find in the city today will inevitably pass into obsolescence, either as monument or as ruin. 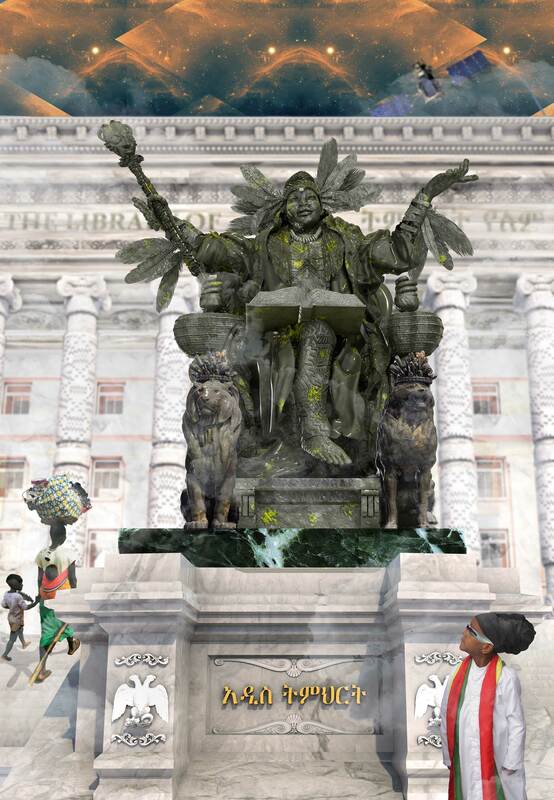 This monument reimagines the statue Alma Mater at Columbia University’s Low Library as a Ugandan woman, displacing the existing statue into an alternate universe—an Afrotopian world where people of color are safe, empowered, and appreciated. The pictured monument bears the inscriptions “new school” (ādīsi timihiriti bēti) and “unlearning” (timihiriti yelemi) written in Ethiopian Amharic G’eez. The words replace the Latin phrase “alma mater” from the original monument as a commentary on the unlearning of ancient languages and knowledge. The work also contains elements of carnival and West African adinkra symbols. 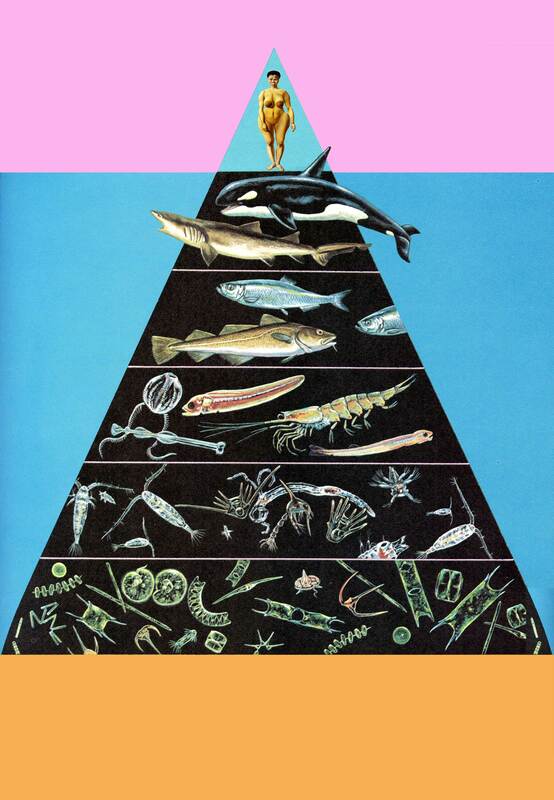 Horizontal, from 1973, is a humorous reference to the traditionally phallic form of monuments, and points to the almost exclusively male subjects they depict. 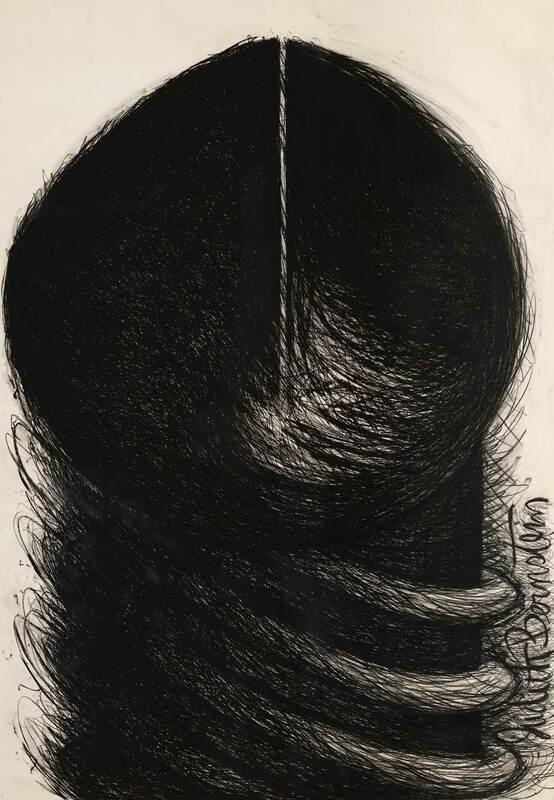 The work is part of an ongoing series of wall-sized screw and phallus drawings Bernstein began in the 1970s. These works are rendered in a loose, gestural style that references graffiti, pop art, action painting, and the artist Lee Lozano, whose 1960s drawings and paintings of screws, wrenches, and other suggestive tools evoke the intense gendering of the art world. Notably, Horizontal was censored from an exhibition in Philadelphia in 1970; for Bernstein, its contemporary reinstatement marks a stubborn refusal of silencing. 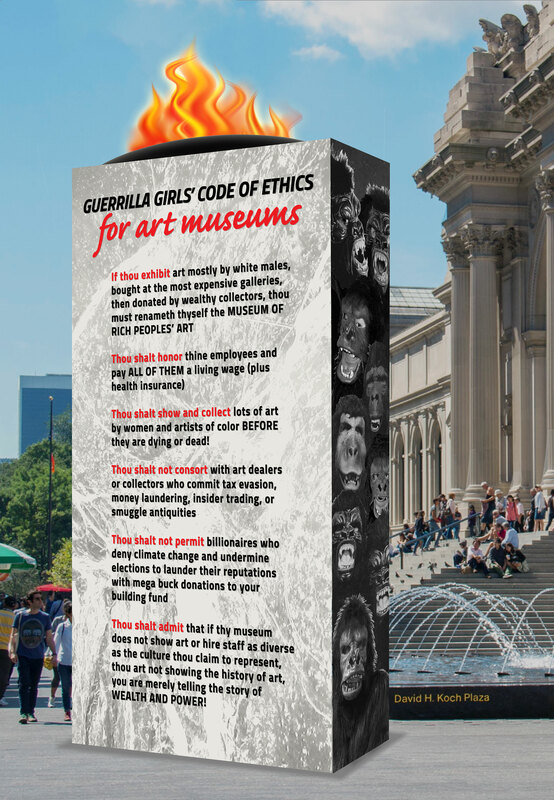 The Guerilla Girls have been exposing sexism, racism, and corruption in the art world for over 34 years. Code of Ethics for Art Museums addresses the takeover of the art market by the superrich, which in turn drives the art exhibited in museums. This poster calls for museums to tell the manifold story of our culture, not just the story of wealth and power. The work is an image of a stele that represents the grandiosity and inflexibility of commandments, and lists aspirational rules referring to museums’ exhibiting, collecting, staffing, and fundraising practices. In 1989, during protests in the former German Democratic Republic (East Germany) demonstrators shouted “Wir sind das Volk” (We are the people) at the Volkspolizei (people’s police). This protest contributed to the downfall of the repressive regime and the unification of East and West Germany. By 2003, xenophobic groups adopted this slogan to demonstrate against immigrants and refugees. Haacke’s updated 2018 “Wir (Alle) sind das Volk” (We (all) are the people) expresses our communion with the migrants and refugees currently exposed to virulent xenophobia, racism, and religious animosities around the world. This poster depicts two versions of the equestrian statue of Marcus Aurelius, the only equestrian bronze statue to have survived from antiquity. In the first version, a series of steps elevate the monument above the crowds, who sit facing away from the monument. In the second version, the monument is sliced in two and turned inside out, with the reversed steps forming an inward-facing theater. 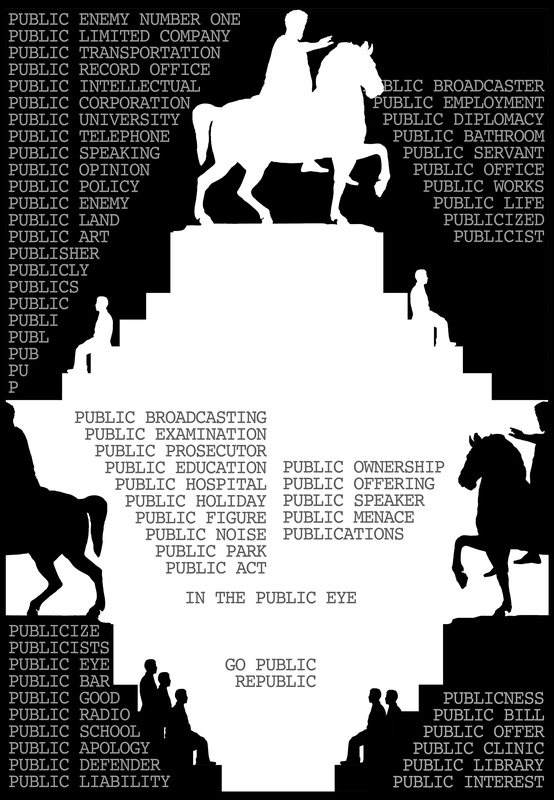 The monument and the theater manifest two different publics, giving them a distinct shape, organizing how people stand in relation to one another, guiding the direction of their gaze, and either inciting or suppressing participation. 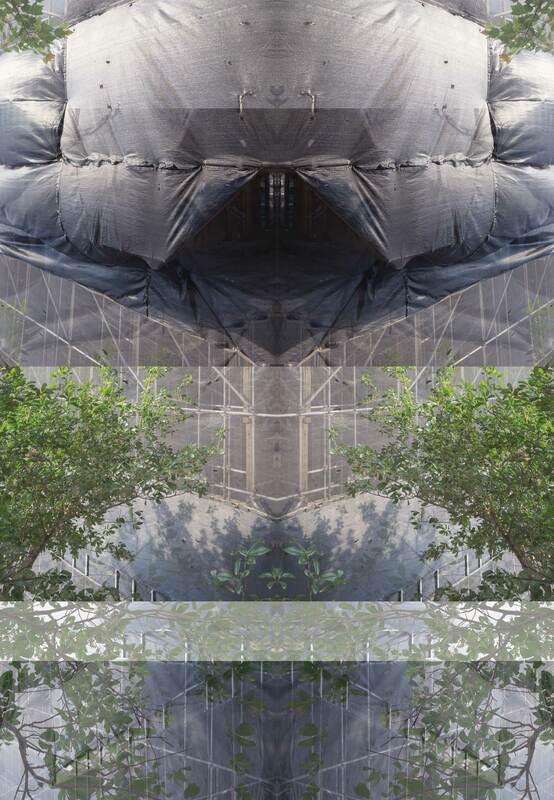 This image stems from a body of photographs that react to our contemporary political landscape. Recognizing the particularly violent narrative of North American history, specifically that of the Black descendants of North American slavery, Simmons inserts one of her text-based paintings into a photographic work. The text reads: “The importance of slavery in the construction of American capitalism white privilege and wealth.” This work investigates how the institution of slavery has impacted the generational wealth and generational poverty we live with today. 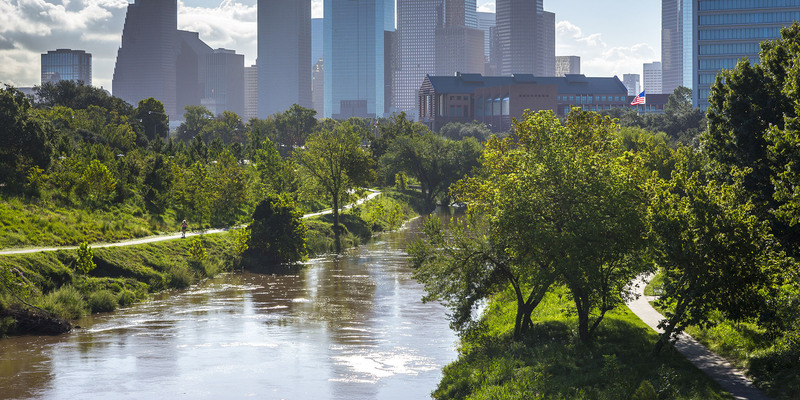 Local supporters of New Monuments for New Cities at Buffalo Bayou, Houston, include East River, a Midway development, and the Susan Vaughan Foundation. 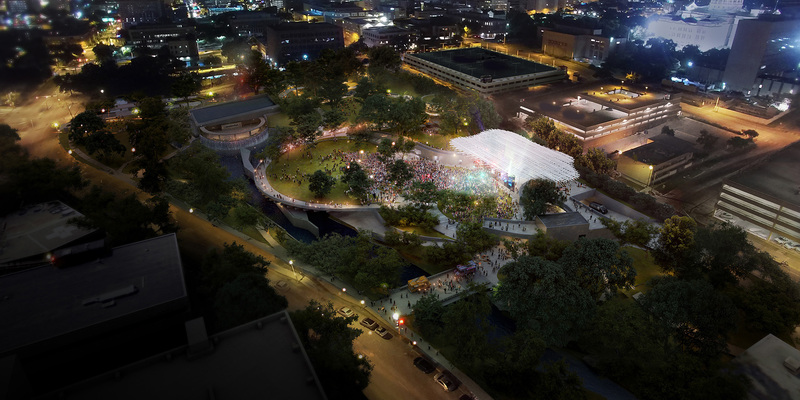 Local supporters of New Monuments for New Cities at Waller Creek, Austin, include BBVA Compass and City of Austin Cultural Arts Division. 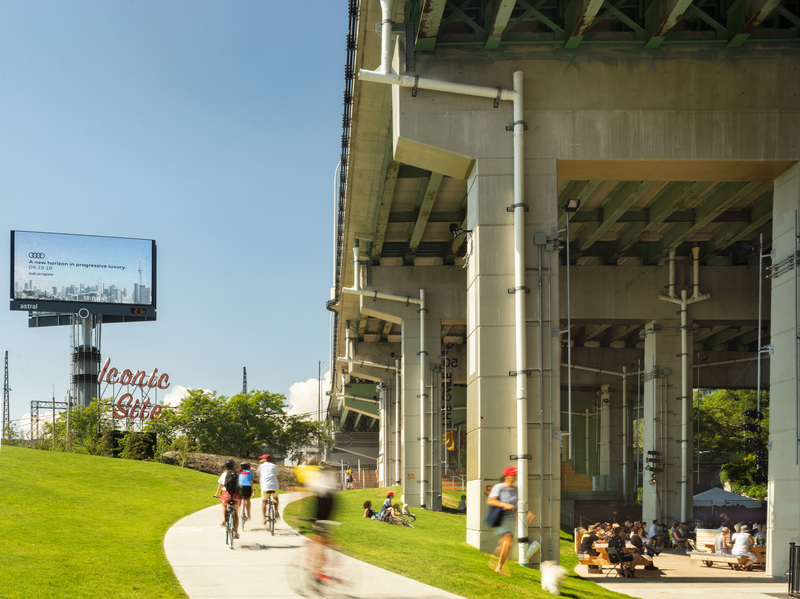 Local supporters of New Monuments for New Cities at The Bentway, Toronto, include the City of Toronto, Ira Gluskin and Maxine Granovsky Gluskin, Donald K. Johnson, O.C. and Anna McCowan-Johnson, Diamond Corp., Northwood Family Office, and Toronto Friends of the Visual Arts.